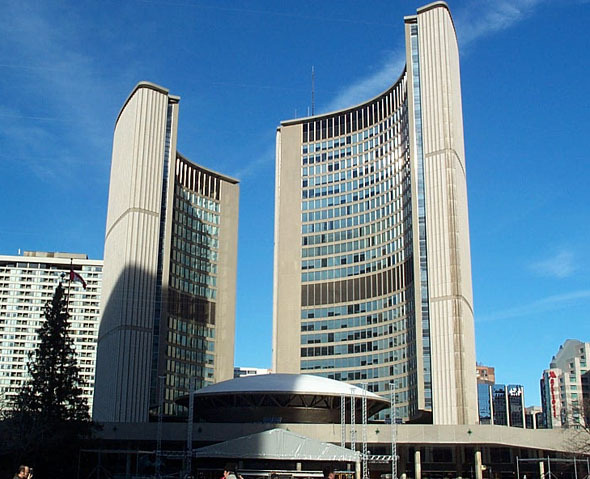 This is the fourth city hall in Toronto’s history. The first was destroyed by fire. The second was temporary. The third, the city outgrew, and it still exists. This fourth one is the result of an international design competition. In a general plebiscite in the 1950s the people of Toronto voted down a proposed Hall in the traditional Classical architectural style. Mayor Nathan Phillips continued to campaign for a Hall after that vote, and won approval for one in 1956 with the proposal to hold an international architectural competition. In 1957, the City of Toronto held the largest architectural competition to that date, and invited 520 architects from around the world to submit their plans for Toronto’s new City Hall. After a year of submissions and public debate, the design proposed by Finnish architect Viljo Revell won. The New City Hall comprises two curved towers, of unequal heights, built around a circular council chamber and public space. It provides a sculptural backdrop for Nathan Phillips Square. The south-facing concave surfaces of the towers are glazed, heating the offices beyond the capabilities of their air conditioning in summer; while the larger convex walls are formed entirely from ribbed concrete, with no window openings. The City Hall is almost Revell’s only work outside Finland. He died before he could see it completed.